The latest available data from the federal courts show that during April 2016 the government reported 235 new civil immigration lawsuits had been filed. These suits have been rising fairly steadily during the past year; the April data represent a 37.7 percent increase from one year ago. According to the case-by-case information analyzed by the Transactional Records Access Clearinghouse (TRAC) at Syracuse University, this number is up 5.4 percent over the previous month when the number of civil filings of this type totaled 223. Overall, the data show that civil immigration filings are up approximately 30 percent from levels reported in April 2011, five years ago. The comparisons of the number of civil filings are based on case-by-case court records which were compiled and analyzed by TRAC (see Table 1). 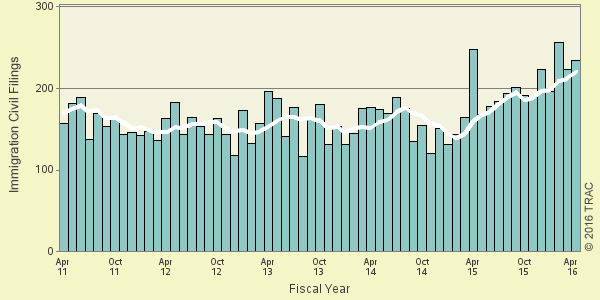 The long term trend in immigration civil filings going back five years is shown more clearly in Figure 1. The vertical bars in Figure 1 represent the number of civil filings of this type recorded each month. The superimposed line on the bars plots the six-month moving average so that natural fluctuations are smoothed out. One-year and five-year change comparisons are based upon the moving averages. Within limits set by Congress and the Constitution, the federal district courts have jurisdiction to hear cases falling under any one of several categories. The single largest number of immigration civil filings during April 2016 was under the classification "U.S. Government Defendant", accounting for 86.8 percent of these filings. 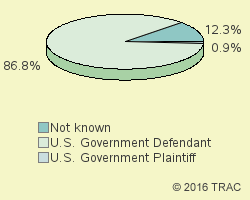 Just 0.9 percent of lawsuits were filed under the jurisdiction category of "U.S. Government Plaintiff." The jurisdiction is unknown for the remaining 12.3 percent of immigration lawsuits filed during April 2016. Court filings are also classified based upon the specific nature of the suit. Table 2 shows the top nature of suit categories recorded in the matters filed during April 2016. "Other Immigration Actions" was the most frequently recorded nature of suit category. This category was ranked first a year ago, while it was the second most commonly invoked category five years ago. Ranked second was the nature of suit category "Habeas Corpus - Alien Detainee". This category was ranked second a year ago, and was the most frequently invoked category five years ago. Ranked third was "Naturalization Application" which had the same third-place ranking one and five years ago. Relative to population, the volume of civil matters of this type filed in federal district courts during April 2016 was 0.7 per every million persons in the United States. Understandably, there is great variation in the per capita number of immigration civil filings in each of the nation's ninety-four federal judicial districts. Table 3 lists the ten most active districts for immigration filings relative to population. The Southern District of New York — with 5.2 civil filings as compared with 0.7 civil filings per one million people in the United States — was the most active during April 2016. The Southern District of New York was ranked fourth a year ago. The Eastern District of New York ranked second. It was ranked fifth a year ago. The Middle District of Georgia now ranks third. It was ranked seventh a year ago. Recent entries to the top ten list were New Jersey and the Western District of New York (Buffalo), now ranked fourth and ninth, respectively. These districts ranked 16th and 36th one year ago and 20th and seventh five years ago. The federal judicial district which showed the greatest growth in the rate of immigration civil filings compared to one year ago — 400 percent — was the Western District of New York. Compared to five years ago, the district with the largest growth — 2,555 percent — was the Southern District of New York. In the last year, the judicial District Court recording the largest drop in the rate of civil filings — 76.9 percent — was the Middle District of Pennsylvania. But over the past five years, the Western District of Louisiana showed the largest drop — 83.4 percent.